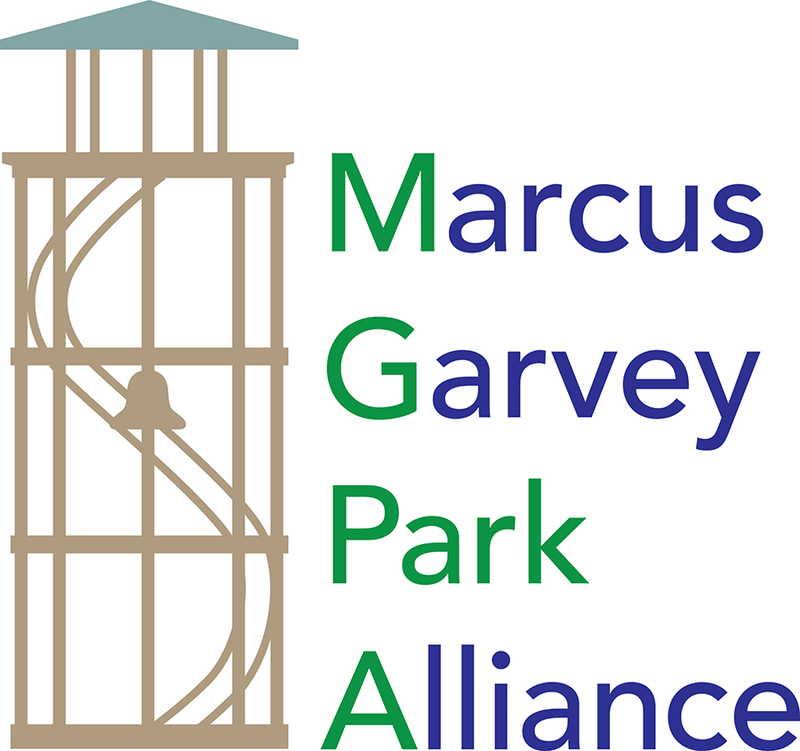 The Marcus Garvey Park Alliance Public Art Initiative is pleased to announce the completion of the White Park Mural. Situated along the designated cultural corridor in East Harlem, the bare back wall, wider than the length of the basketball court in the newly renovated park was the perfect canvas for public art. East 106th Street between Lexington and Third Ave. The White Park Mural is a collaborative effort by three local Latino artists: Giannina Gutierrez, Ralph Serrano and Jeremy Vega. Collectively, the three separate and distinct murals weave together a scene of sport, art and community and embody the energy of both the park and the surrounding neighborhood. Pictured at center is basketball legend Cesar Fantauzzi, who is an East Harlem Native. He is surrounded by colorful images of park and street scenes. The Public Art Initiative is an ongoing program spearheaded by the Marcus Garvey Park Alliance to support local artists of color and women artists and to exhibit temporary public art installations throughout Harlem, East Harlem and Northern Manhattan. The Public Art Initiative committee works collaboratively with community and arts organizations to facilitate projects with city agencies and to attract both private and public funding to supplement the costs of fabrication including materials and installation. East Harlem At Play is produced by the Public Art Initiative of the Marcus Garvey Park Alliance in collaboration with Friends of White Park, and Friends of Art Park Alliance. This public art project is co-presented by the Marcus Garvey Park Alliance, NYC Parks and NYC Department of Health and Mental Hygiene, in collaboration with the Fund for Public Health in New York City and the Centers for Disease Control and Prevention. You can view art in all of East Harlem parks by following the Art Walk Park to Park Map. Atlas is a monumental Steel sculpture standing 14′ tall. The installation was created to symbolically represent the magnificent multiplicity of Harlem, the cross-section through time of stellar individuals who have called Harlem their home and those who continue to live, work and contribute to its cultural vibrancy. It symbolizes a “universe” of stars that celebrates actors, writers, composers, musicians, painters, sculptors, educators, historians, activists, entrepreneurs, and community leaders. They are among many who have emerged from this community and serve as vital inspiration to resolve present day challenges through their commonalities in history and purpose for the benefit of its neighbors and our city at large. Atlas pays homage to and revitalizes the resilience and endowment of all daughters and sons of Harlem. A performance project by Bryony Roberts, Mabel O. Wilson, and the Marching Cobras of New York. Commissioned by Storefront for Art and Architecture. Best views of performances will be along the Multi purpose area near the East 122nd Street entrance to the park on the East Side of Marcus Garvey Park. Presented by the Marcus Garvey Park Alliance in collaboration with Storefront for Art and Architecture as part of Performa 17. Supported by the National Endowment for the Arts, the Graham Foundation for Advanced Studies in the Fine Arts, and the Lower Manhattan Cultural Council.